Aspire Tigon 3.5ml Tank - Aspire Vape Co. Introducing the Tigon kit, an easy to use ‘child safe’ compact tank from ASPIRE. It comes in four stylish color finishes, Stainless Steel, Blue, the ever-popular Rainbow, and Black. It can be used as an MTL (mouth to lung) or a restricted DTL (direct to lung) vape. Whichever size you choose, you can be sure of a great performing tank with great flavor an vapor production It is the first Aspire tank to use an ingenious design that will seal the wicking holes in the tank when the coil is removed. The easy maintenance Aspire Tigon tank is, of course, removable and as previously stated comes in a standard 3.5ml version and a 2ml TPD version, both have interchangeable 510 drip tips for either MTL or DTL style vaping. The Tigon tank comes supplied with a choice of MTL, longer style, drip tip and a slightly wider bore ‘stubby’ style drip tip more suited to restricted DTL hits. The filling couldn’t be simpler in a child-proof/leak proof tank of this type. First, pull up on the top cap, then with your thumb or finger on the marker, slide open the top cap to reveal the silicon leak-proof seal of the fill port. The silicon fill port on the TPD version tank has a self-sealing valve into which you can insert your chosen filling bottle nozzle to fill the tank. Closing the tank is the opposite, slide the top cap back into place covering the silicon seal and push down. On the Aspire Tigon tank, coil replacement is just a case of unscrewing the base hardware, pulling out the old coil and replacing with a new one. Then screwing the base hardware back on again. Note that the Tigon tank can still hold e-liquid when changing the coil, this is because the wicking holes in the tank are covered by a spring loaded sleeve that will slide shut sealing the holes when the coil is removed. Remember, before using a coil for the first time to let it stand for 5 minutes after filling with e-liquid to saturate the coil and avoid dry hit and damage to the coil. When removing and/or replacing the glass tube on the childproof TPD version of the tank, you need to follow these steps. First, unscrew and remove the base hardware and pull out the coil. Then invert the tank and using the special key provided, unlock the top hardware by placing it in the slot of the screw holding the top hardware (see diagram). Next, remove the glass tube. Replace the glass tube and follow the steps in reverse, (it is easier to place the screw onto the key first to locate it into the top hardware), secure the screw, insert the coil and replace the base hardware. Remember, before using a coil for the first time to let it stand for 5 minutes after filling with e-liquid to saturate the coil and avoid dry hit and damage to the coil. 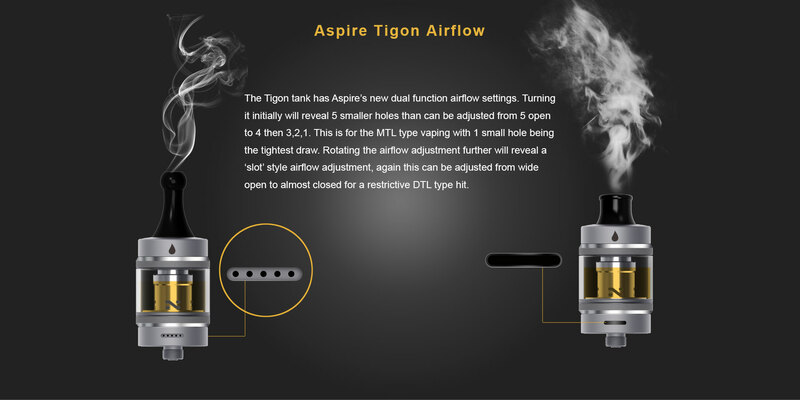 The Tigon tank has Aspire’s new dual function airflow settings. Turning it initially will reveal 5 smaller holes than can be adjusted from 5 open to 4 then 3,2,1. This is for the MTL type vaping with 1 small hole being the tightest draw. Rotating the airflow adjustment further will reveal a ‘slot’ style airflow adjustment, again this can be adjusted from wide open to almost closed for a restrictive DTL type hit.